Cataract Indiana. Cataract Falls. Mill Creek. Indiana's Largest Waterfall. I guess no one has thought much about paddling here. Maybe it has been paddled some, often, or once before today. In deference to our ancestors, elders, and peers, and out of respect for the universal heartbeat, in which humankind plays only some of the interesting roles, I refrain from using the term "first descent". "Second descent" is an honorable way to pay respect and still suggest bold exploration. Today, at dawn, with the aid of my new paddling friend, Rhett Moore, I descended this pretty slice through Indiana's terrain. Information about previous visits is welcome. Please view and join the Surf Cataract Indiana Facebook group. The adventure began in the most innocent way, an evening discussion with a friend who had come to visit Neylan, new daughter of Mona and me. That was roughly two weeks ago. Prior to this, Mona and I moved to Indiana, back in 1998, and I occasionally joked about the steep creeks of Indiana, usually when I would paddle Cascades Creek at the northern end of Bloomington, which has a half-pipe ford that forms a pretty dull little wave at the downstream end during a flood. I had, for the most part, given up on finding any whitewater north of the Falls of the Ohio. As Mike Englert and I discussed Bloomington that recent evening, he mentioned the latest issue of the new biweekly paper, The Free Press, and the two page spread on Cataract Falls, by the photographer David Britton. David's article was an encouragement to readers to get out and explore this pretty state. Fortunately for me, the paper still had a light circulation, and the article was published in August, a time when IU students, some of them paddlers, have yet to return for the Fall semester, and also a time when many in Bloomington take a vacation. When Mike gave me his copy of the Free Press, and I read the article, my heart raced, and my inner boater smiled! This was the beginning of a wonderful new relationship with my new home state. 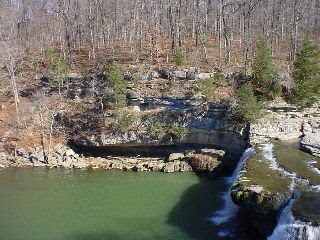 I found a couple of web sites on the falls by searching 'waterfall indiana'. You won't find any good steep creeking by searching 'paddle indiana'! From what I could tell, Mill Creek was not a paddling destination, yet it is close to Bloomington, Indianapolis, and Terre Haute, towns with plenty of good paddlers. In fact, Cataract is just south of Avon, Perth, and Brazil, east of Paris, Poland, Fairbanks, and Jordan, north of Vicksburg, Newark, Cincinatti, Hindustan, Pleasantville, and Freedom, and west of Columbus, Edinburg, Brooklyn, and Hope. Mona, Neylan, and I drove to Cataract on the Saturday evening before the torrential Labor Day central Indiana rains. We found a wonderful, high, rocky falls in a quiet, but accomodating state park. There are a couple of overlooks built river left of the upper falls, downstream of the covered bridge that is out of service. We gazed at roughly 10 cubic feet per second of water that, by the time it reaches the falls, is brown and smelly from its headwaters in the southwest edge of greater Indianapolis. The water cascaded over Indiana limestone, which has an abrasive grippiness similar to concrete. Only a very thin layer of slime generally covers river beds here, or no slime at all, and the rocks are generally broad, flat shelves, so paddling here involves a gripping hazard that must be acknowledged. Hidden limestone will change your direction much more forcefully and surprisingly than any wave will. 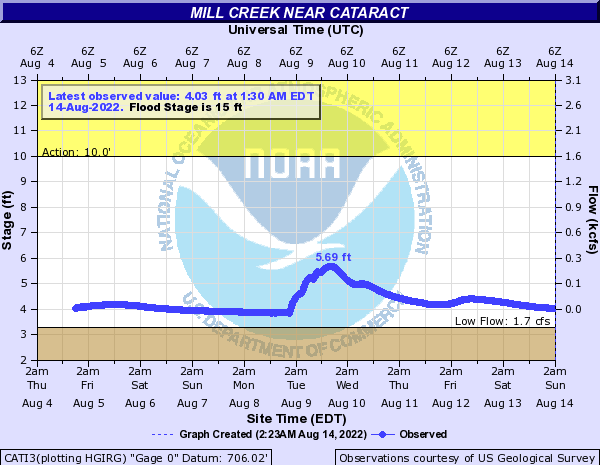 After the torrents of Labor Day, I checked the real-time gauge for Mill Creek at Cataract, provided by the USGS, and replicated in the gauges section of the American Whitewater web site. The creek rose from 10 cfs to 4000 cfs in two days, and it was showing no signs of dropping. Tuesday evening, we ran back to the falls to admire the other extreme, and were duly impressed. 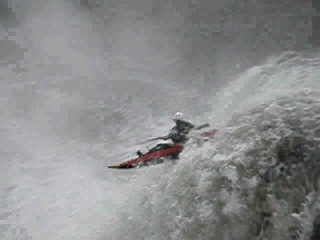 I would not paddle the falls at 10 cfs, and I would have to be very careless with my life to jump on it at 4000. I was reminded most of Triple Drop on the Russell Fork at 3500 cfs, although for the most part, I see Big Sandy's Wonder Falls in the Upper Falls. If I could, I would name the falls Wonder Indiana, but I abide by established names unless there is general agreement that a paddler's name has more pizazz. The lower falls at 4000 were thundering as well, but the dark of night obscured our view. The lower falls are reminiscent of a shortened Cumberland Falls, when they, the lower falls, are not inundated. 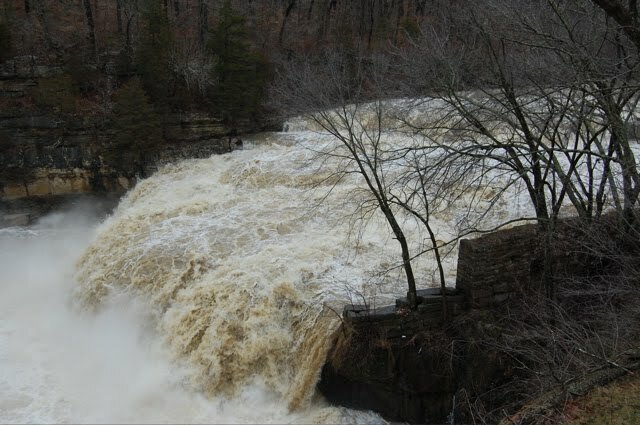 In the summer, the lake downstream, Cagles Mill Lake, should not reach a height to impact the lower falls, but in times of high water, this drop can disappear under the impoundment. The upper falls is said to drop twenty feet, after the entrance drops, which total to about ten feet. The lower falls is said to plunge eighteen feet at its final ledge. After viewing the flood, I realized that this creek that I had intended to explore and document in a leisurely manner over the winter and spring could be no more ripe, given that the flow was high enough to predict a safe level, and the water and weather were pleasantly warm and inviting. I monitored the level over the following work week, and called some key players. Kevin Colburn, American Whitewater's southeast coordinator is a good paddling friend who I had already written to regarding the best approach to opening the creek to paddlers. Trip Kinney is another good paddling friend, and I knew that he and Kevin might be willing to drive eight hours for this uniquely located descent. I also called Rhett Moore, a local paddler whom I had met while playing ultimate this summer. Rhett is from Knoxville and worked as an Ocoee guide with guides I knew from the late eighties. I have never paddled with Rhett, yet, he readily accepted the challenge of jumping into this unknown territory with such short notice. I also divulged my plans to Mona. Every paddler with a wife and/or child has to come to terms with the reality that death or maiming on a river has a terrible impact on his or her family. I have no intention of causing pain to my family or myself, and I have enough experience in these matters to know that it is likely. I have the skills, judgment, and experience to rate the severity of this section of whitewater, and at the right levels, these drops, while significant, pose a similar threat as that of Wonder Falls in West Virginia. Other people may not have this comfort level, especially having seen the falls at 10 cfs or 4000 cfs, with no paddler in the mix. My desire to run these falls, this week, caused strain in my relationship with my family. I am sorry that I caused such pain. My only excuse is that I have been a student of the flood since I was a child pulling styrofoam hot dog boats in the gutters of my street, and I am sane enough to competently judge my ability to navigate the flow with minimal harm. All paddlers need to respect the fears of their loved ones at the same time that they respect the calling of the currents. By Friday evening, it was obvious from the gauge that the window of opportunity was quickly approaching. Mill Creek crested at 6000 cfs on Wednesday morning. I wish I had seen that! On Friday, I received word that Kevin and Trip would not make the trek. However, Rhett was still ready to go. We had planned earlier in the week to shoot for Sunday evening, but we agreed that Saturday at pre-dawn would provide the best flow and fewest witnesses. Rhett picked me up at 4:45am, we loaded some gear, and drove the forty minutes north to Cataract. Darkness had just started to lighten as we first approached the creek, just upstream of the upper falls. Rhett's first glimpse was of the entrance to the falls. This ledge is cute at 600 cfs, but not necessarily one worthy of the production of a stealth descent. He liked the idea of paddling it, and asked if it was the upper falls. I then showed him the main drop, which is simply glorious at 600 cfs, in the foggy dawn's early light. After examining the entire rapid for the best lines, Rhett expressed an understandable apprehension about running the drop, first thing in the morning. This was a fortunate turn of events for me, since I had found the lines that would give me a presumably safe passage, but in the dark of the night, "some gear" that was loaded did not include my fine Silver Creek paddle! That was still on my front lawn. Better still, Rhett's skirt was drying from his trip to Hatteras, and he had forgotten to load another one. Rhett offered to hold rope for me, and capture the run using the 40 second video setting on my digital camera. He would then meet me at the lower falls for a similar setup. I appreciatively borrowed Rhett's graphite paddle, and walked up to my Vista Rio T. This inflatable was designed by Brad McAllister and me for ease of rolling, stiffness during impacts, adequate hull speed, and enough air under the foam floor to cushion vertical impacts. I eased the boat into the river, stepped in, and immediately enjoyed the warm, active water above the falls. I paddled upstream for a bit to warm up, did some stretches and sweeps, and engaged in my favorite paddling prayer, modified for the occasion. "Air, land, water, tree. Guide my boating as I need, to make my run over these narrs - and back to Neylan and Mona - without any bumps, scrapes, bruises, or scars." Down I stroked, to the lip of the entrance. I ran way left, but not quite at the left edge, so that I could kick the boat left as I dropped, into some still water an inch or two above the left shelf. This went very well, and I enjoyed a lift of confidence. I ferried across a nice little wave, through the fog, to the center of the river, eddied under the shelf of the entrance ledge, and waved to Rhett. Although I wanted to delay the run so that I could thoroughly savor the moment, I saw that he was capturing the moment to pixels. I turned downstream into the main center tongue, and dragged for more than a second on some Indiana limestone. As I nudged myself over to some current, I adjusted my line to land on top of the left curling wave in the tongue. This carried me to the strong right curler, which acted as a buffer from the left edge of the river, where a tree waited at the base of the falls. The right curler lined me up for a fantastic launch off of the protrusion in the ledge that I decided was the ideal launch point, even at 10 cfs. I sailed off the nose, pointing left, and glided pleasantly to a landing in the froth. It was a very happy occasion for both of us, since the video stopped just as I landed. There we were, on a Saturday morning in central Indiana, watching the first rays of sunrise burst through the swirling fog, over warm, muddy froth hurtling down a high cliff. I floated downstream, amidst protective kingfishers and heron guides. Fish were jumping, and the creek was as pretty and alive to me as the Green or Big Creek. I savored the float, and then spotted the next horizon line. I pulled over, began to scout, and waved to Rhett. I walked further down river right, and noticed a large pool, so I clambered back to my boat. Besides the limestone shelves, a paddler here must be very aware of the locust trees. The clusters of daggers on these trees are thick and strong, more so than I have seen in Appalachia. I paddled over to river left, and talked with Rhett. I asked if he thought the lower falls was not impressive. He was puzzled. When I saw his face, I remembered that the topo map of this river shows inundation of the lower falls, almost all the way up to the upper falls. Sure enough, the flood of the prior week filled the lake, to the point that it covered the falls! I paddled down to the ledge, probed with Rhett's paddle to show him the underwater location of the beast, and then sunk his paddle into the pool just beyond the immersed ledge. It disconcertingly disappeared into the deep, and eventually returned to the surface. We took out, walked to the van, and then walked to Little Sister Falls, which is on a creek that comes into Mill Creek just downstream of the Lower Falls. This, too, was inundated. Walking back to the car, we spotted a DNR truck, and froze, but I suggested that we were okay to paddle the lake. Then we noticed that the man who was walking directly to my duck, was bending down to pick up a soda cup. We talked with this former resident of Beckley, West Virginia, and he informed us that, indeed, a person with a fishing rod could wade up to their eyes in Mill Creek, yet scouts were not even allowed to launch their canoes into the lake from this parking area below the falls. We also are supposedly not allowed to paddle between the falls. Based on the posting of one or two signs near the river, it would appear that some division of a state agency may be regulating, and limiting, our ability to appreciate the river from within - or without as sometimes happens - our water craft. From a preliminary scan of the IDNR web site, there may not be policy behind these supposed rules. The Indiana Natural Resources Commission documents Mill Creek as navigable from its junction with the Eel River, upstream through Putnam, Owen, and Morgan counties. Maybe this is not a large issue, since the funding is so minimal that mowing the grass at the parking area is discouraged, but from conversations with people on site, it is possible that paddlers will not be able to mix freely with falls gazers, photographers, and fishing people unless the people of Cataract are able to see the benefit of increased visitation to the river by paddlers who exercise caution and good judgment. Since paddlers are boaters and not swimmers or waders, generally speaking, maybe there is no real conflict at all, at least with the posted restrictions against swimming and wading. 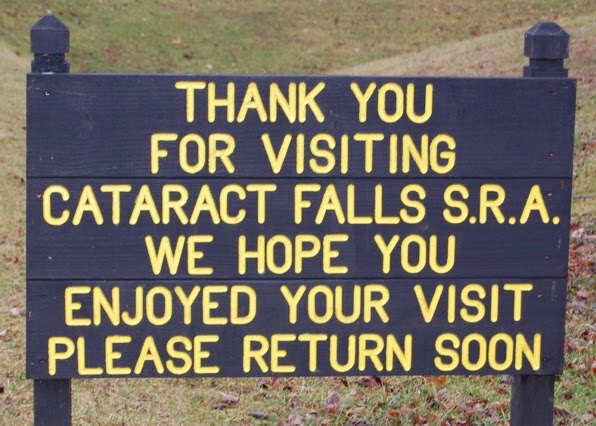 Cataract itself is a little town that does cater to visitors by maintaining an old-fashioned image. If you visit the area with boats on your car, consider staying in town for a bit to meet the people and perhaps to engage in some good old-fashioned commerce. Note 3/8/2011, bl-uits-tucson has been retired. Links to a few remaining image collections will be fixed. It is possible that any paddler caught entering Mill Creek from above Upper Cataract Falls down to the Cagles Mill Lake will encounter questions and even legal action from Leiber State Recreation Area staff. I cannot expect other paddlers to refrain from paddling where I have been, but I humbly suggest that all attempts are launched at dawn's earliest light, preferably with no witnesses. Paddler tourism could invigorate this exceptionally beautiful section of Indiana. Be the friendliest ambassador of your sport that you can be, and understand that people who are unfamiliar with the concept of 'the boof' often see no good reason for ever paddling whitewater, scouting rapids, or swimming. If you journey to Cataract to make a descent, know that the park has visitors from morning until well into the night. Weekdays, and winter or spring, are the best days to minimize witnesses until this jewel of Indiana becomes a legitimate paddling destination. Full moon descents are recommended for those paddlers comfortable in such an environment. NOTE: It's been almost 6 years since I wrote about the access questions, and I have not seen or heard of any problems, and I have heard of a few descents. If you scout ahead of time, put in upstream of the park, and paddle through quickly, you MIGHT be okay access-wise, on this navigable river. I think wading while scouting would be a thorny issue. Send me your opinions or experiences. Have fun and be friendly to the employees! --Tom 5/29/09. USGS gauge readings on September 6, 2003. Go to the bottom of the list, Mid. Wabash. Look for a level near summer pool to see if Lower Cataract Falls is available. NEW (May 14, 2010) - dialing in the surf at Lower Falls: When the lake is between 650 and 660 (black line), the Lower Falls are near inundation. Couple that with 1000 cfs (blue line), and there may be some good surfing and squirting. Given the height of the drops, and the seriousness of a bad landing, the upper and lower falls should be rated Class V. The tree at the base of the upper falls certainly adds to the risk. Nov 28, 2004: The tree has flushed out of the base of the Upper Falls, and most falls leapers these days would consider 20 feet to be an acceptable height. The approach to Upper Falls is tricky, and deserving of a V rating. The Lower Falls has an easy entry, many alternative lines, and a fluffy landing in a big pool, so Class IV is appropriate. Descent of Upper Cataract Falls, by Tom Visnius. September 6, 2003, 6:30am. 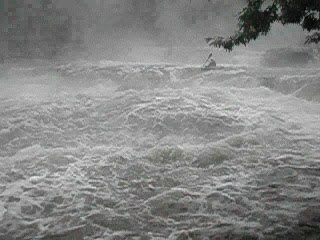 Bill Patterson runs Lower Cataract Falls, November 28, 2003, 10:30am, 800cfs. Images of Cataract Falls, September 6, 2003. There are a few JPG photos from the start of my recon, until I decided that video clips would be easier to analyze. Some of the QuickTime video clips are pretty short in duration, unlike the movie of my run, so the files are smaller. Images from MLK Day January 15, 2007 at noon. The flow was around 4200 cfs. The peak that week was the next day January 16 at 9am, at 4810 cfs and 16.07 feet. On the topic of sustained flow, the river rose to 500 cfs on January 13 at 2am and remained above 500 cfs until January 19 at 11am! These levels were a result of a total of 2.85 inches over 4 days. (Jan 11 - 0.03 inches.) Jan 12 - 0.55 inches. Jan 13 - 0.59 inches. Jan 14 - 1.01 inches. Jan 15 - 0.67 inches. 8. probably looking upstream from river right at lower falls, not as steep as it looks. Upon Further Reflection, September 6, 8pm. I returned in the afternoon and paid the daily admission fee. I took pictures, hiked the falls with the dogs, and talked with the employee at the gate. Here are some additional observations I had while driving home. My tale does not relate the AUDIO experience. The magic of the gorge is the absence of technological noise, and the overwhelming input of natural sounds, including water pounding, spray, echoes of same, various birds, bubbles, fish jumps, bugs. The sonic environment is equal in the level of impression to the visual beauty. As for tatse and smell, the water is tainted. There is brown foam in the pool below the upper falls, and I had a funny flavor sensation in my mouth after landing. The water could be bad for your skin, too. Since the river is draining a large area of Indiana farmland prior to entering the gorge, the water can be very warm in the summer, but it could be laced with numerous agricultural and industrial pollutants. Expect the river to be very cold, possibly frozen, in the winter. 400 cfs looked bony. A rigid hull is recommended below 500 cfs, since shallow limestone will grip and cause drag on fabric hulls. Rigid hulls slide more easily. HOWEVER, the falls are high enough that landings can cause spinal compression, or shock to lumbar muscles, especially in a rigid hull. Test the depths of the pools to determine landing zones that allow meltdowns or partial meltdowns. These rapids are not for unconfident paddlers with no technique in matters of the boof. Provide self-reliant safety procedures and mechanisms. Take responsibility for actions. Use the river right access, within the Owen-Putnam State Forest boundary. Use a higher put-in, on river right or left, above the main bridge on Cataract Falls Road. If you put-in miles upstream, such as at Hwy 231, you can have a wonderful day trip. You will get to see what paddling in Indiana is typically like. It's generally very pretty and quiet. The lower falls river right take-out requires a walk-up. The river right road gets close to the lower falls, and is a great take-out when running just the upper falls. Or, paddle down the lake for a mile or two. Do not use the left side river bank, or else pay the recreation admission fee. To run repetetively, the easiest walk-up is on the left, next to the stone wall (the remnants of a mill), which is a park facility. Always carry your boat when walking trails, and prevent erosion of trails. If using overlooks, lawn, restrooms, stone wall, etc, pay for the service ($4), and do not use while boating. The annual entrance permit gets you into all DNR properties, effective Jan 1 to Dec 31. Move through the falls quickly, so as not to be stopped. Ignore attention. Scout thoroughly, prior to donning paddling gear. Consider saving howls and hoots for the take-out. This is a favorite spot for romantics. American values, right of free passage: Indiana claims to celebrate freedom and independent expression. Paddling the falls is a celebration of individual expression. The river is in public domain. Paddling along its waterway is a right, and we are free to exercise this right, but local state employees are not jurists. They are not contractually equipped to make judgment calls, so it is probably best to avoid them. There is a bridge saying "Mill Creek" south of where Hwy 67 forks off of Hwy 231. The creek may be good, but it is not a tributary of Mill Creek. This Little Mill Creek feeds directly into the White River to the south. A fascinating advantage to the lower falls being covered is that really large walleye from the lake swim all the way up to the upper falls, congregate and swirl in the eddies, and leap up into the spray. They are plentiful when this happens, and they put on a great show at the base of the upper falls! There is a turn off of Hwy 231 to Cataract. That is a neat back way, but not direct. Look for the turn to Cataract Falls. Jim's Equipment Sales is on the corner. The gas station where Highway 67 forks off to Martinsville has pizza, incense, ephedrine, and liters of Pepsi for one billion dollars. Thanks to this web site, and most likely the new listing in the AW river inventory, Bill Patterson of Southern Indiana contacted me last week. We exchanged a number of emails. Bill has paddled many of the creeks of Alabama, so I knew he would enjoy seeing Mill Creek. We had some decent rains this last week, and Mill Creek came up to 2000 twice. It is a very reliable run, with wide windows of opportunity. The easiest day to paddle, by far, was Friday after Thanksgiving. By Friday morning, a cold front was already moving in, so we faced a drizzly, cold morning that was not going to get any warmer. The level was around 800 cfs, and the lake was down to winter pool, so this was an ideal occasion to paddle the falls - both of them. We also checked Little Sister Falls, on the creek near the takeout. That was not a very interesting rapid. I hope to fill in more details of the run later. For now, I can say that we had a wonderful morning. I captured some more video. One of Bill running the lower falls, and one of the lower falls on its own. Bill's run was my first video of a paddler, so I had no idea how very still you need to be. In 2004, I wrote to the offices of Indiana DNR and Indiana State Parks. I specifically mentioned kayaking Cataract Falls and the signs that recommend against swimming and wading, and boating between the falls. Indiana DNR has no problem with people navigating a legally navigable waterway - end of story. Indiana State Parks has never replied to two correspondences. Their lack of concern sets a precedent for their being unable to show concern in the future. So, have fun, but please continue to be mindful of local superstitions and fears, and spend money conspicuously, somewhere nearby. Please contact the Surf Cataract Indiana group for more discussion. A new set of pictures showing 4200 cfs flow has been added to the Recon section. I am happy to post pictures of anyone's runs or other activities at Cataract Falls, recent or long past. Porting the Descending Cataract Falls Indiana web site to dusurf.com. Removing outdated information and working through the links. Added the Facebook group Surf Cataract Indiana.